The Bay Bridge connecting San Francisco and Oakland may not be as iconic as the Golden Gate but it's a vital traffic artery nonetheless. 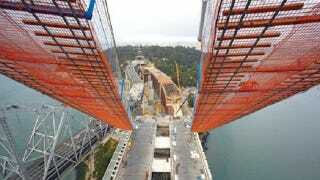 So how do you reconstruct the span without delaying its 280,000 daily commuters? Very carefully.